For the love of life: Samantha Walker Creative Team Blog Hop! Samantha Walker Creative Team Blog Hop! Welcome to our Samantha Walker Creative Team Monthly Blog Hop! You should have arrived here from AJ's blog! If not, please hop onto her blog to see what fun things she has for you! Anyway, I used Samantha's Unity Stamps called Girly Dots. Talk about a cute set! I thought it was perfect for a little emboss resist look using Creative Imaginations Twinkling H2O's. The process was really simple! I just embossed my pretty butterflies onto white card stock, and painted over it with the Twinkling H2O's. I had another butterfly which I embossed on a separate paper and painted with yellow paint, than punched out with a butterfly punch and now I have another pretty butterfly, which I added to the corner of the word Dream and added a little rhinestone to it. Cute, isn't it? Well, hope you like my happy little card! And as usual we have some chances to win prizes. To enter, just leave a comment on my blog during May 9th and May 14th. Winner will be announced on Samantha's Facebook page on Monday May 15th. To receive the additional entries, and get the link to the free SVG file, mention in your comment on Samantha's blog (www.samanthaleewalker.blogspot.com) that you have done so! 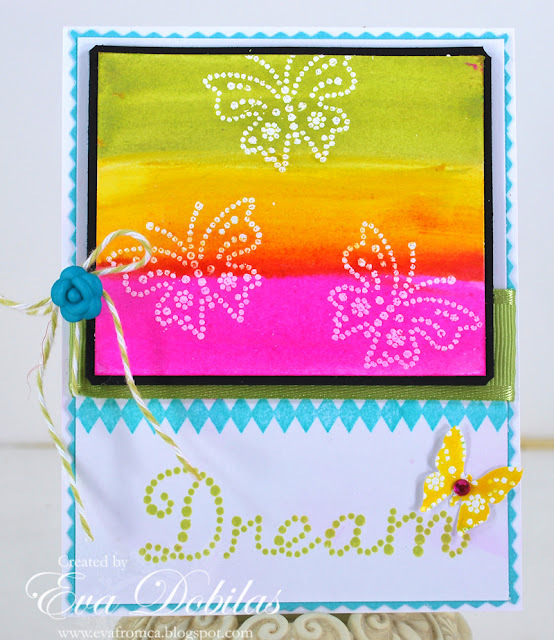 And now it's time to hop over to Joscelyne's blog to see what fun project she has waiting for you.